LAST CHANCE - 25% Off Everything in the C-store! TODAY IS YOUR LAST CHANCE TO SAVE 25% IN THIS YEAR'S BLACK FRIDAY SALE! 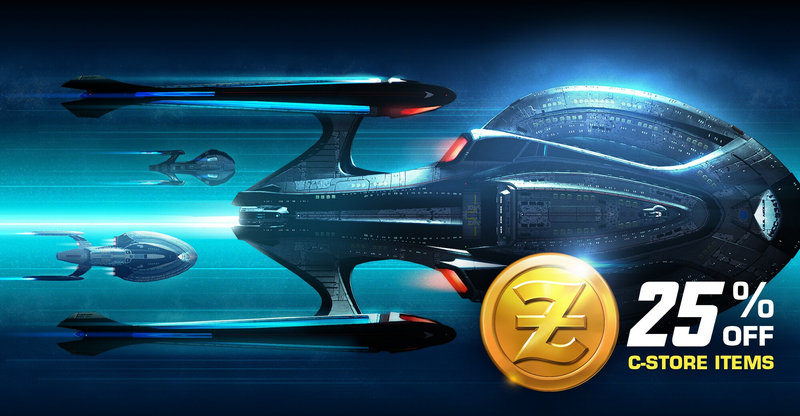 It’s that time of year once again, Captains – the Star Trek Online Black Friday sales are on! In addition to the previously announced ways you can save on Zen and Packs on all three platforms, we’re pleased to announce that from November 21st at 8am PT to November 27th at 10am PT, all items in the C-store will be 25% off, on all three platforms! That means ships, inventory slots, duty officers and more will all be yours for the taking, Captains. Get out there and get those items you’ve always dreamed of. Not only that, but for a limited time only starting today, players will be able to purchase the Key Ring Bundle! This special pack includes 20x Master Keys (used to open any Lock Box) for the price of 2250 Zen, normally. For this Black Friday sale, it's 25% off! As an additional special promotional offer when purchasing this bundle, every pack also includes a single Ultimate Tech Upgrade. Applying this item to any upgradeable piece of equipment will instantly set both its Mark and Quality to maximum (usually Mk XV and Epic/Gold quality) with zero Dilithium Cost! This promotional bundle will be available in the C-Store beginning November 21st at 8am PT to November 27th at 10am PT.